Island Peak also known as Imja Tse is one of the most popular trekking peaks in Nepal located at Khumbu valley for climbing on Himalayas. The combination of Everest base camp trek and Island Peak climbing is probably the best trip in Nepal adored by adventure seekers. From Dingboche the mountain is seen as an island in a sea of ice. Imja Tse not only provides an enjoyable climb but also provides some of the most spectacular scenery of Himalayas in the Everest region. 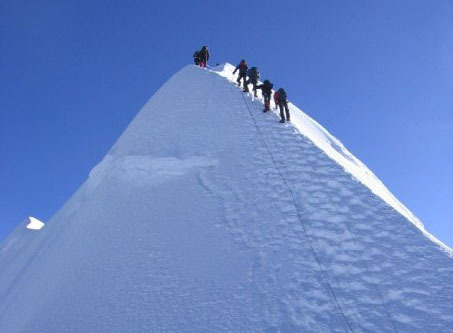 Seen from the summit the giant mountains, Nuptse (7,879m), Lhotse (8,501m), Lhotse Middle Peak (8,410m) and Lhotse Shar (8,383m) make a semi circle in the north. 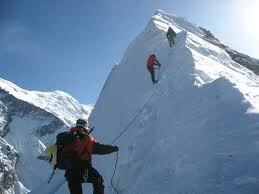 The views of Makalu (8475m) in the east, Baruntse and Ama Dablam in the south add more charm in climbing Island Peak. 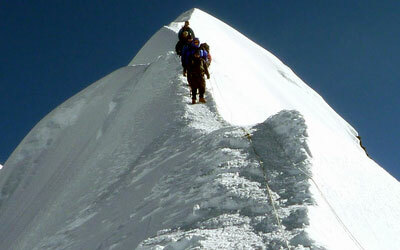 For many mountaineers climbing Island Peak marks the beginning of climbing on Himalayas to prepare for a big Himalaya expedition in Nepal in the later years. 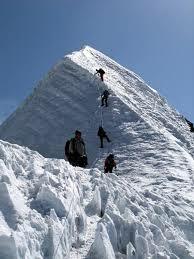 For some mountaineers the peak stands for the purpose of acclimatization before heading to bigger mountain climbing. 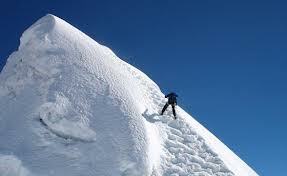 Trekking to Kaalapatthar or Everest base camp is best suited for acclimatization before proceeding to the climbing on Island Peak.